A primer on this subject is [Bussard and DeLauer, 1958]; some design practice and details may be found in [Turner, 2005]. A conventional solid-core NTR of the NERVA type consists of a compact nuclear reactor in which a certain number of heat exchanger channels heats flowing hydrogen propellant to the maximum temperature allowable by materials, of order 2,000 to (in the future) 3,000 K [NASA, 1990]. Hydrogen works both as propellant and as reactor coolant: below ^2,500 K, at which dissociation into H atoms would start, it remains in its molecular form. This limits NTR performance to Isp less than 900 s at most, for typical chamber pressure of order 70atm (about 1,000 psia). Replacing hydrogen with liquid methane to increase density impulse reduces Isp by a factor of nearly 2. Performance would deteriorate slightly more using water as propellant, and since water starts dissociating into oxygen and hydrogen at these temperatures, safety would become a problem, even though density impulse (the product of Isp times the specific density) would be much higher using water than either hydrogen or methane. 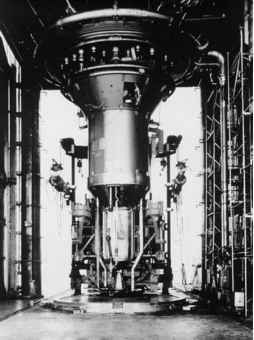 During the NERVA program water propellant was discarded precisely because of safety concerns, but probably a second look at its convenience from the viewpoint of overall mission efficiency would be advisable now. The thrust/weight ratio of conventional NTR is lower than in chemical propulsion, of order 0.25 or even less; this because of the topology of nuclear fuel elements ("rods"), since fuel occupies a small portion of the reactor volume, and because of the radiation shield. Heat deposition inside the heat exchanger elements and friction losses were responsible in NERVA I for a substantial pressure drop (2530%), which contributed to lower the thrust potentially attainable. While the first loss is unavoidable (it is often called the "fundamental loss'' when heating a fluid), the second could be reduced by optimizing the number and shape of rod channels. The key elements of a solid-core NTR reactor are the fuel rods, heat exchanger (cooling) channels, control drums, moderator and the neutron reflector that prevents neutrons from escaping the reactor and slowing down nuclear reactions too much. The entire assembly must be enclosed in a pressure vessel, see Figures 7.6 and 7.17. Conceptually, a complete rocket reactor differs little from an industrial gas-cooled nuclear power reactor, see [Lawrence et al., 1995, Fig. 8.4], except temperatures are deliberately higher, to produce a compact and light power package. The NERVA I prototypes delivered about 1 GW and weighed only about 7,500 kg including the 100: 1 area ratio nozzle. The neutron shield added 1,590 kg. Of course, the reactors were supposed to last for no longer than 1-2 hours, compared to the many thousands of hours of a commercial power utility reactor. 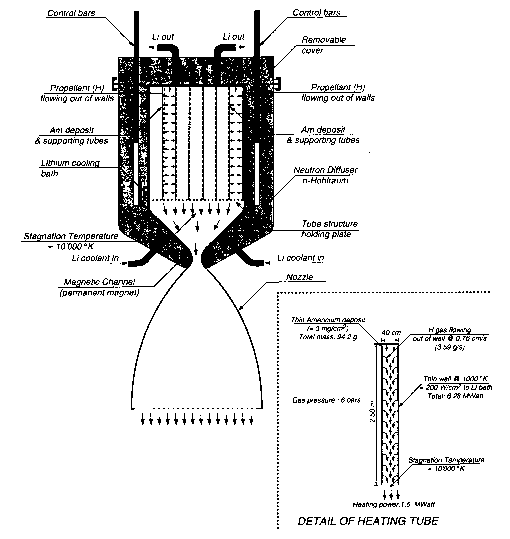 A significant design feature of all NTR designed and tested under the NERVA program was that fuel and heat exchangers were tightly integrated in the very design of the fuel rods. Their compactness minimized weight, but made refueling (a feature not designed nor conceived) nearly impossible in space operation. The NTR of that time were designed to be capable of multiple restarts, even up to tens of times, but they were assumed to last only until complete fuel burn-out. Once the fuel was spent, the entire NTR was to be discarded. The reason for this design philosophy was the gradual deterioration of the reactor materials caused by high temperature, pressure and neutron fluxes. Neutrons damage materials, including fuel itself, by dislocating their atoms, or creating new nuclei upon capture (this results in "poisoning" the fuel). Solid-core NTR are still the design philosophy proposed by NASA-Glenn for Mars missions (e.g., see [Borowski et al., 1999]). This philosophy runs contrary to what is ideally desirable: an engine that can be refueled on demand by reasonably simple operation. The NERVA-type design architecture may be justified on the ground of mass, safety, and operability; nevertheless, the risk is to develop throwaway nuclear launchers/space vehicles, with their associated problems of cost, environmental risks and politics. To prevent this possible outcome, structural reliability and refueling of future nuclear reactors should be a priority. Advanced NERVA-type NTR, incorporating modern material technologies and new fuels, have been proposed and discussed, invariably for Mars missions. With advanced NTR based on past NERVA technology, mission time still exceeds 2.5 years, too long for the dose of cosmic and other sources of radiation the crew could safely stand [Flinn, 2004]. The fact is, NERVA-type engines have Isp still too low to substantially reduce the total mass of an interplanetary ship. With Isp of order 800 or 900 s too much propellant is needed not only to accelerate, but also to decelerate a spacecraft for an interplanetary mission where it must orbit its final destination. In principle, powered deceleration can be replaced by aerobraking, if the planetary destination, like Mars, has an atmosphere (an aerobraking spacecraft loses speed by inserting in a spiral orbit that periodically ''dips'' inside a planetary atmosphere, producing drag). Even with the help of aerobraking, the mass of the Mars return vehicle estimated by the team at NASA-Glenn is 169 tons [Tauber et al., 1990]. The Cargo Lander and Habitat Lander must be added to this mass when calculating the total mass to lift to LEO. These figures are the end result of NTR with Isp of order 900 s.
Similarly to the results of the [Donahue and Cupples, 2000] analysis, the NASAGlenn team concluded that their NTR-powered Mars manned mission needs a ''Magnum'' heavy-lift launcher capable of lofting to LEO (e.g., 407 km) some 80 tons of payload in a single flight. The ''Magnum'' still does not exist, although the recent Space Exploration Initiative of President G.W. Bush includes the Ares V heavy-lift launcher, derived from Shuttle and Apollo technologies. In an effort to reduce mission mass there have been recent proposals to reduce at least the engine weight of NERVA-type designs, for instance see [Mowery and Black, 1999]. The baseline design was the NRX XE Prime engine built by Westinghouse/ Aerojet General and tested in the 1970s; see Figure 7.20. Its core is conceptually replaced by a beryllium ''island''. The authors' neutronics calculations show this island can replace the NERVA I reflector, reducing the weight of this conceptual engine to about one-tenth of XE Prime. The result of this exercise is a shielded rocket engine capable of 20,000 lbf thrust and weighing about 34,000 lb, including propel-lant for 20 min of operation. Based on a steady 2,500 K reactor temperature, achievable using Russian structural materials, the Isp predicted is about 900 s. The calculated overall engine weight is about 7,400 lb, with a thrust/weight ratio slightly less than 3. Perhaps the most significant result of such calculations is to show that improvements are still possible on conventional NERVA-era designs by using new architectures, materials and ideas. Figure 7.20. Westinghouse NRX XE experimental nuclear engine on its test stand. however, spacecraft in the 100-ton class have never been really designed around missions utilizing aerobraking. Presumably, reinforcing and thermally insulating their structure may add much weight. However, if Isp is too low, this solution would become mandatory to avoid a powered Mars orbit capture that would consume much propellant. It may sound disappointing, but one must conclude that NERVA-type designs, even improved with respect to the NERVA I engine, cannot be labeled "the" practical alternative for long interplanetary missions, unless their mass can be orbited using low-cost launch systems, probably utilizing some form of airbreathing propulsion; see Chapters 1 and 4. In fact, if the public accepts nuclear propulsion, NTR could, technically at least, complement and perhaps replace chemical stages in launchers: this was the initial sole motivation for the ROVER program. Assuming a A V = 8 km/s, typical of LEO insertion, increasing 7sp from the 380 s of a LOX/LH2 rocket engine to the 1,000 s achievable by a NTR would reduce the propellant-to-total mass ratio from ^0.9 to ~0.5, reducing staging and launch costs. NTR for space launchers are being explored at the US Air Force [Vacca and Johnson, 2004]. A second class of missions where the large thrust of a NTR would be very convenient or perhaps indispensable is that of intercepting asteroids moving too close to the Earth. Even recently near-Earth objects (NEO) [NASA, 2005a] have been detected too close and too late for comfort [Jarow, 2000]. Many trajectories of known asteroids might pose a future danger to Earth, see [University of Pisa, 2005], to the point that the phrasing of the so-called Torino scale weighing the potential effects of an impacting asteroid has been recently toned down [Nature, 2005]. No chemical rocket can economically accelerate to the many tens of kilometers per second typical of many asteroids orbits [Powell et al., 1997]. In fact, if an NEO trajectory looks like posing a danger, the last desirable strategy is to intercept it head-on to destroy it, as in science fiction movies: the unpredictable fragments' orbits could be just as dangerous. A more reasonable solution is to nudge the NEO towards a different orbit, and this requires matching its velocity closely. Propulsion systems capable of large accelerations, even at the expense of efficiency, may be mandatory for such missions. Time will tell whether the ever-present NEO threat may contribute to revive NTR research.